I've been putting off blogging for a while as I have been waiting for some news to tell you, but it looks like it will not be happening now, or will at least be delayed a while. Tantalising I know, but I can't tell you more until things are finalised! 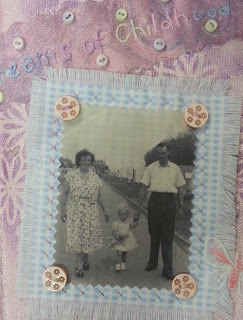 Talking of Tantalising; I received the first entry for the Craft Arena Tantalising Textiles competition today. Entry forms need to be with me by Sunday 12th May, but that doesn't mean you have to rush to complete your work as that does not need to be here until 31st May! 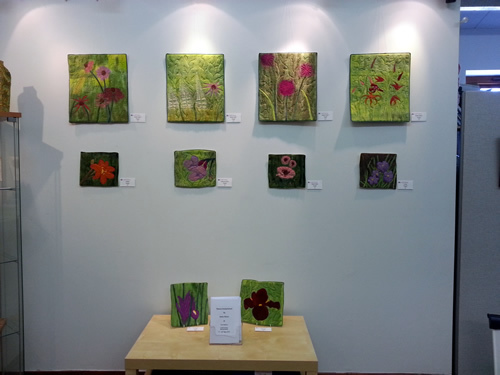 Today sees the start of an new exhibition in The Gallery at Craft Arena entitled Nature Embellished. Debs Nixon has used Hedgehog Gardens in Norfolk as inspiration for her body of work using embellishing, beads, machine and hand embroidery. I think they look great! Do come and see them; the exhibition ends on 30th May. I've nearly finished one of the pieces for the Minerva exhibition in September. Our theme is Childhood Dreams and one of the projects is a memory book. This is the front of mine - still a bit to go and then I can concentrate on the other two pieces! I'm hoping to send a newsletter out at the end of this week; better get writing!